Years ago, Rickie abandoned her husband and children in Indianapolis and headed for fame as a rock and roll musician in Los Angeles. Or so she planned. She failed. She lives there still on the second floor of a shabby motel, working by day as a checkout worker in a grocery store and by night as lead singer in a local bar band where a few patrons rise to her music in the often nearly empty room. If that’s not a promising premise for a family drama, the kicker is that the movie was designed and built for Meryl Streep who taught herself to play the guitar for the role and is, as we might all guess, terrific. Wearing a next-to-the-right ear waist long braid and rocker black, she plays and sings well but, with Streepian wisdom, she doesn’t overdo the talent factor because we must remember that in this story, Ricki fails. When her ex-husband calls with the bad news that their daughter, Julie (Mamie Gummer), is in a severe suicidal meltdown after being left by her husband, Rickie flies immediately to Indianapolis. She is greeted with cordial neutrality by her ex, Pete (Kevin Kline), whose wife Maureen (Audra MacDonald) is away tending to her own father. She is greeted with crushing hostility from Julie and her two sons. The interest in this stilted reunion for the audience is the acting interaction between Meryl Streep and the highly talented Mamie Gummer, Streep’s daughter on screen and off. After the flight to Indianapolis, the family is introduced in quick clips that are far too short to generate any genuine interest or compassion. The family drama short circuits. In their limited appearances, Nick Westrate and Sebastian Stan play the two alienated sons. That’s it. They are merely introduced. The family drama needs to play out and doesn’t. The return of Pete’s wife Maureen ends both the reunion and the tension though not before we are treated to a deeply real performance by Audra MacDonald as wife number two. In her few scenes, MacDonald stuns us to full alert by creating, in just a few scenes, an exceptional woman. We are tempted to imagine Macdonald, with the voice of an angel, joining Streep and Kline in song, but that’s an unfortunately sentimental wish from a fan. Ricki, banished, returns to Los Angeles for a prolonged period of bar room singing with her now serious boyfriend, lead guitarist Greg (Rick Springfield.) Springfield does well as the man Ricki rediscovers. The band – all rock veterans – includes Rick Rosas on bass and Bernie Worrell on keyboards. 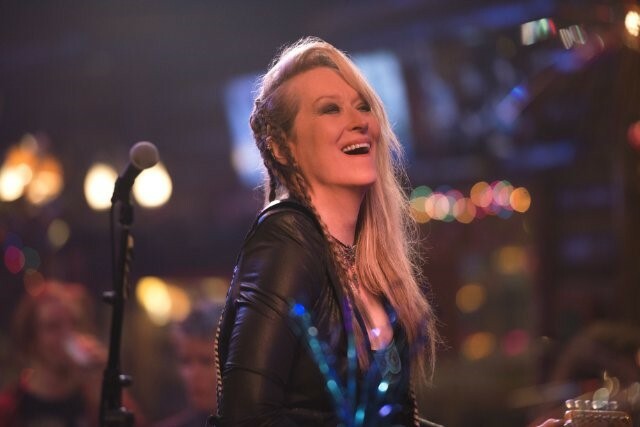 Ricki settles back into her life as a confident mediocre rocker who loves being a bar room singer. This oddly structured movie wouldn’t work if it weren’t for the pleasure of watching Meryl Streep tackle yet another identity. Rock and Roll today; what’s next in her life plan? Whatever it is, it’s always worth it. We’ll be there. This review was posted on August 23, 2015, in Comedy, Drama, Musical. Bookmark the permalink.